STO.DOMINGO,ALBAY (Dec. 12) – Fifteen (15) Indigenous People’s (Aeta) families will no longer scamper for safety during typhoon and flashfloods at Barangay San Isidro, here. The Local Government Unit of Sto. 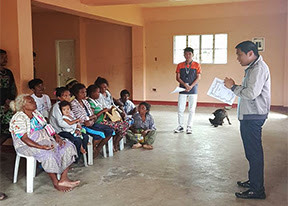 Domingo in coordination with the Provincial Government of Albay and the National Housing Authority awarded Aeta families living near the protective dike of Basud River with housing units at Resettlement Site in Barangay San Andres. Municipal Administrator Jun Aguas who attended the turn-over ceremonies in behalf of Mayor Herbie Aguas Tuesday morning express his gratitude to Gov. Al Francis Bichara, National Housing Authority, Municipal Social Welfare Development Officer Mariz Villanueva, Punong Barangay Rexan Banua and other stakeholders for their unwaivering support to realize the project.